I may or may not be becoming a crazy cat lady. LOL! My little kitty family is finally complete, though. I received a gift of an orange kitty this morning, with the message that every Lucy needs her Desi. So… Desi 2: Electric Boogaloo! Lucy looks pleased, don’t you think? So last night we introduced Aldwyn to Rift. He’s not a gamer, even less of one than I am, so we got to be total noobs in there. Ulaa joined us, and she’s a lot more experienced in the whole thing of online MMO type games, luckily for us. 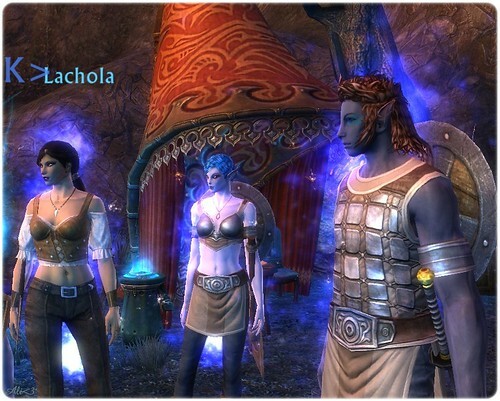 I’m the one in the middle, the purplish elf looking thing. We all started as new characters so we could stay together. The rest of the night was a blast as we ran around, did quests, and laughed and laughed on Skype. Oh, and Aldwyn was the first to die on us. I have to admit, Rift is loads more fun when I have my two faves with me, but it’s still not a game that I’ll end up buying. It’s not worth it to me to pay a subscription fee for a game that I might only play 2-3 times a month. But it’s been an interesting experience, that is for sure! I managed to get myself invited to the Rift beta weekend. I love beta testing, beta events, beta viewers, etc. Even if I don’t actually KNOW what it is, I sign up for many beta things because I like to see what’s up. Now let me preface this by saying that I don’t consider myself a gamer. I got into Dragon Age, big time, because of the story. I love The Sims because I like the whole micromanaging aspect. 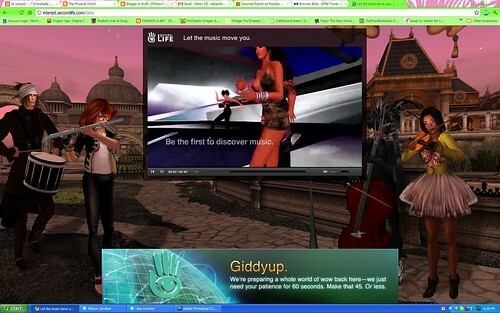 I’m still nuts about Second Life because it’s not a game, I can shop, and be beautiful there. But games like World of Warcraft or Everquest never never interested me. Partially because I like games where I can use a god mode or a money cheat, and partially because I don’t usually enjoy playing games with other people unless it’s like a board game or Wii game. 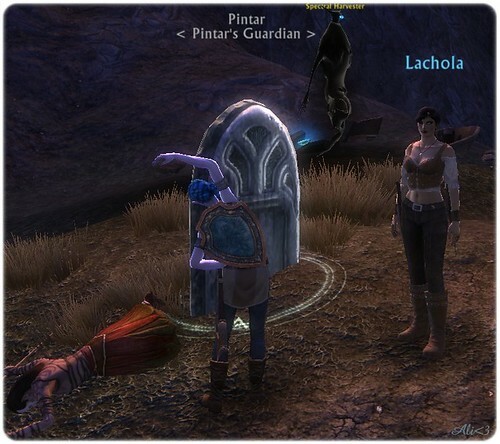 Rift is my first bigger type MMO. I was huge in Legend of the Green Dragon for a couple of years, helped run servers, coded modules, all that nerdy stuff. But that was browser based with no avatars and it didn’t require much thinking. Within 5 minutes of Rift, I realized that this was going to take some work. My main character right now is a warrior Elf. I chose the Elf purely because she was smaller and prettier than the other classes, although I’m pretty much not down with her purple skin. I tried, though. I’ve been playing off and on this afternoon. When I get irritated, I log out. I’m logging out pretty much every 10 minutes. 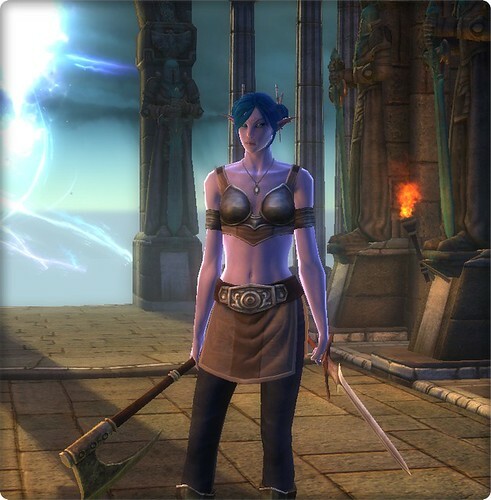 I’m unsure what weapons are really best for my elf. I don’t know why people have pets and I don’t. I’m following quests without any idea as to what I’m doing. I’m trying not to read chat because it’s just exceedingly annoying. I think some people have been helping me out, but I’m not actually sure. Is it pretty? I guess so. It’s a little dark for my tastes. I like bright scenes where I can see stuff. I can’t really take a look around at the scenery because there’s freakin’ things coming to kill me all the time. I move around easily enough, although I have seen people complaining that Rift’s lag is much worse than World of Warcraft. All I have to say about that? 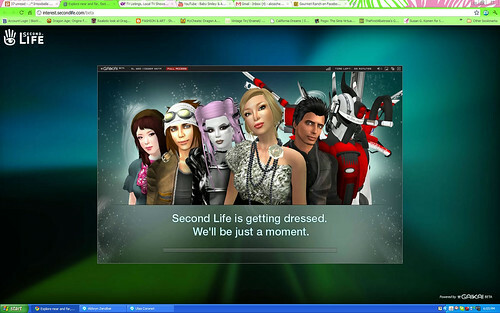 Honey, I’m from Second Life. If I can walk, it’s all good. Day 353 – Oh hi, guest! 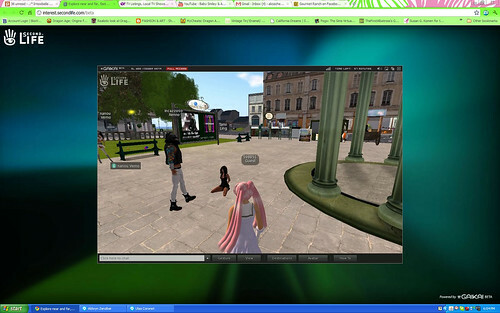 As I mentioned in my last post, I was going to use the browser SL while I was in world and go meet up with my guest avatar. I don’t know why. I just…wanted to. But I still like her pink hair. 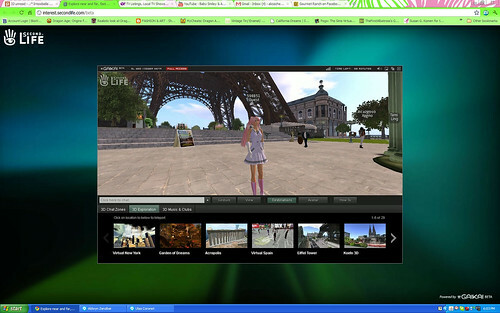 So you know, the whole “omg, SL in your browser!” thing has been talked about for a while. Personally, I always thought it sounded like a bad idea and I’d way rather have an IM service I can use with SL when I’m not in SL, or a better way to manage inventory & notecards while offline. But who listens to me, right? Today I saw they opened up the beta for the browser thing. You can check it out over here if you wish to. You will NOT be with your own avatar. This is very very very beta and you’ll join the world as a guest even if you put in your SL email. These are straight screenshots from my computer. I didn’t edit anything at all. Also, I didn’t quite go in order with some of them because I just realized that I should have taken a screencap of the start-up page, and at one point my internet flickered slightly and I had to get a new guest avatar. Okay, so, you go to the page and you are forced to watch this kind of cheesy little video while everything loads up. It makes SL look pretty damn fun, actually. Just so you know, you won’t be the first to discover music. Music was discovered a while ago. After the video and everything loads up, you’ll be asked to put in your email so you can start it up. No big deal, but they will send you an email after you log out so if you don’t want the email, I guess use an account that you never check. You’ll show up as one of the default avatars, but if you press the avatar button, you’ll be able to change into…well, one of the other default avatars. I chose the “Female Cosplay” av because I liked her pink hair. Oh, you also do not have a name at this point either. You’re just a guest. After choosing my avatar, I clicked on the Destination button and decided to go to the Eiffel Tower. Because why not, right? You cannot teleport anywhere except whatever is in the Destination guide, you do not have any inventory, and you can’t take your clothes off. You know I tried!! So if you’re thinking that you could use this to get your SLex on while at work – not in this beta. In fact, I don’t think you can even private message anyone. At least, I did not see the option. Oh, also? I realize this might be a big part of SL and maybe it’s better to throw it at a newbie first thing so they know what’s up, but I’m not QUITE sure that Linden Lab wanted this to be part of the new user experience. Welcome to SL! Come get a Master! I went to a few other places but there’s just not a whole lot you can really do at this point. And hey, it’s beta, I get it. I didn’t expect to even be able to move, actually, so the fact that I could run around was pretty good. I did try to dance at some 80s club but that was a no-go. I could sit in a chair, though! One of the funny things to me was the teleport screen. Really, SL? You’re getting dressed? Why bother? Most of your residents don’t. Anyway, it’s kind of fun to just be a super-noob in your browser, but don’t expect too much right now. I’m going to attempt to run it in my browser while I’m in world later to see if I can get a better photo of the guest avatar. But hey, give it a try. New stuff is fun to play with.